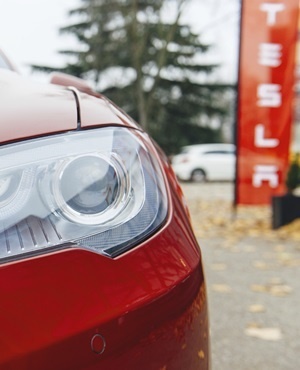 Tesla received permission to start selling its Model 3 in Europe, clearing the final hurdle in bringing the electric-car maker’s top seller to the home turf of Audi, BMW and Mercedes-Benz. Deliveries should start in February for the Long Range Battery version of the midsize sedan - the same variant first sold in the US - according to Tesla, after Dutch vehicle authority RDW issued the OK. The European launch is crucial for Tesla as it navigates what chief executive officer Elon Musk called a "very difficult" road ahead. The company is cutting jobs so it can profitably deliver lower-priced versions of the Model 3, Tesla’s first car targeted for the mass market. Musk has pointed to sales of the sedan in Europe and China as a main reason he isn’t concerned about any potential setback caused by a halving of the US federal tax credit, to $3 750, on Tesla purchases as of January 1. The Model 3 became the top-selling luxury car there last year, outstripping the Audi Q5, BMW 3 Series and other well-known models. Analysts and industry executives, however, have observed that competition with Tesla cuts across traditional categories. "Teslas are stealing customers away from vehicles that you might not expect," EvercoreISI analyst Arndt Ellinghorst said in a report last week, after Toyota’s North American chief, Jim Lentz, discussed the impact of the Model 3 on the Prius, a hybrid that’s not marketed to luxury buyers. The Toyota executive said Tesla has created a new segment of so-called technology-driven products. Traditional automakers are fighting back with their own electrified models. Jaguar began delivering the I-Pace all-electric sport utility vehicle last year, while Daimler unveiled its EQC electric crossover and Audi followed with the E-Tron.